The sleek, modern design of the Zenith Drafting Table offers the versatility suitable for various projects. The main work surface features five adjustable angles, from flat to 40 degrees. The height of the table adjusts 6 inches, reaching a maximum height of 38" . The table also includes a 24" pencil ledge and a spacious storage shelf below. 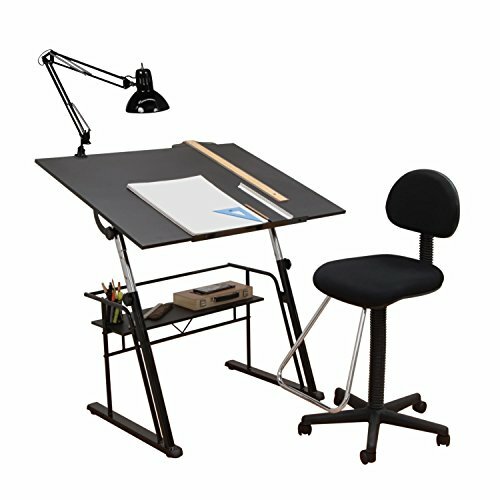 Main work surface: 42" W x 30" D. Overall Dimensions: 42" W x 30" D x 32.5" -47.25" H. Also included in the Zenith Drafting Set is Studio Designs' Maxima II Drafting Chair which adjusts in height up to 32.5" . It features a padded seat and backrest that can be adjusted for all-day comfort. A chrome teardrop footrest protrudes from beneath the seat. The chair sits on a stable five-star nylon base with wheel casters. Modern and sophisticated, the Swing Arm Lamp with Bulb complements the sleek, contemporary design of this office set-up. The lamp's flexible arm built of steel springs and tension control knobs extends up to 36" . Features a sleek, high gloss finish. The clamp mounts easily to any Studio Designs table. 100 Watt U.L. approved for U.S. and Canada. Includes 13W CFL Bulb. Net Weight: Lbs. Carton Weight: 74 Lbs. Carton Dimension: 45.25" L x 34" W x 11 " H.